On Feb. 9th 2012, Chromocell celebrated the hiring of its 100th team member in an event showcasing the support provided by the New Jersey Economic Development Authority. Chromocell team members have taken full advantage of training grants offered by the New Jersey Department of Labor and Workforce Development. Ongoing educational assistance is offered by the New Jersey Community College Consortium for Workforce Development and BioNJ. Jane Oates, Assistant Secretary of Employment and Training Administration at the U.S. Department of Labor and Commissioner Harold J. Wirths of the Department of Labor and Workforce Development spoke in the lobby of Chromocell prior to a tour led by CEO Christian Kopfli. Also in attendance were Joann Perla-Morales, president of Middlesex County College and Debbie Hart, President of BioNJ. Chromocell was launched in late 2002 in the Commercialization Center for Innovative Technologies (CCIT) on the EDA’s Technology Centre of New Jersey campus. Chromocell has since expanded to the Biotechnology Development Center (BDC) also on the New Jersey Technology Centre campus. 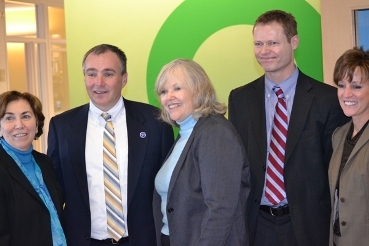 Pictured: Jane Oates (center), Assistant Secretary of Employment and Training Administration at the U.S. Department of Labor, Commissioner Harold J. Wirths (second from left) of the Department of Labor and Workforce Development, Joann Perla-Morales (far left), president of Middlesex County College, Debbie Hart (far right), BioNJ President, and Christian Kopfli Esq. (second from right), Chief Executive Officer of Chromocell.